Jazeman Jaafar continues his Blancpain Endurance Series campaign this weekend with his first six hour race of the season at Paul Ricard circuit in Le Castellat. After becoming the first Asian to claim victory in the Series last time out at Silverstone, Jazeman is keen to build on this with another podium in France. The 1000km race marks the halfway point in this season’s Blancpain Endurance Series and is a prelude to the blue riband event in the championship, the Total 24 Hours of Spa, which is held early next month. The Paul Ricard six hour race is also unique to this season with the race starting just before dusk at 18.00 local time and finishing in darkness at 00.00 to make it an even tougher challenge for both drivers and car. 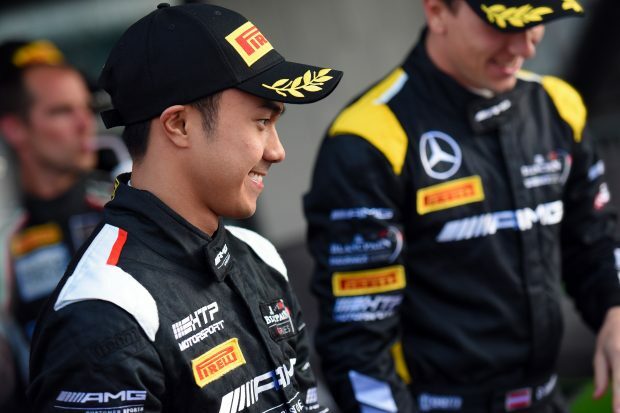 Jazeman re-joins his team mates at HTP Motorsport, Maxi Buhk and Dominik Baumann for the weekend, with the trio sharing driving duties in one of the team’s Mercedes AMG GT3 cars, one of 57 cars that will be on the grid at Paul Ricard. The race weekend is a short format with practice and pre-qualifying on Friday, final qualifying on Saturday morning and the evening race later that day. Jazeman looks ahead to the weekend saying, “I can’t wait to be back in the car and I’ve excited to have more time behind the wheel with the longer race distance. It’s a good preparation for the 24 hour race with the night running, as well as being a challenge as a race in its own right. Having just enjoyed watching a very tough Le Mans 24 Hours, I’m very pumped for getting on track myself. Free practice for the race is on Friday 24 June from 14.10 to 15.40, with the Pre-Qualifying session from 17.05 to 18.35. Qualifying is on Saturday from 09.45 to 10.45, with the race start at 18.00. The race will be streamed love online at www.blancpain-gt-series.com/live and will also be shown on Eurosport, check listings for timing.